SA-Dakar Rally: Sensational 3rd place for Toyota - only 29 kms to finish line. They initially set their sights on 10 place, hardly daring to dream of achieving their ultimate goal of 5th place, but an outstanding performance and hard work means they are now looking at finishing 3rd: Giniel de Villiers (Stellenbosch/South Africa), Dirk von Zitzewitz (Karlshof/Germany) and their Imperial Toyota team are on the brink of a huge coup at the Dakar. 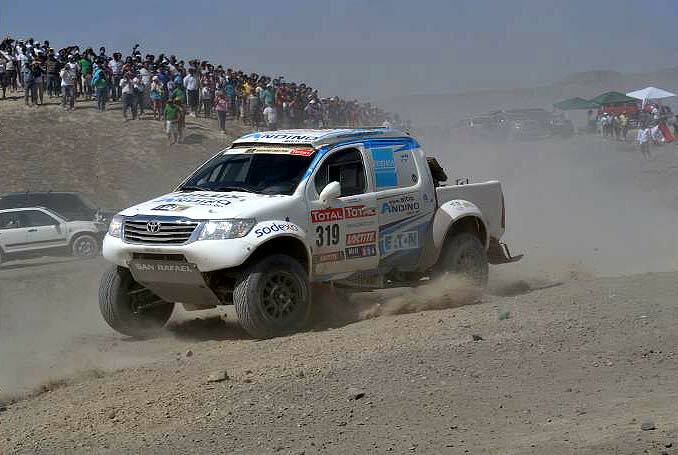 Driving their privately developed and prepared Hilux pickup, 2009 Dakar winners de Villiers/von Zitzewitz clocked the second fastest time of the day on the penultimate stage of the Rally Dakar between Nasca and Pisco - their best individual stage result of the rally so far. 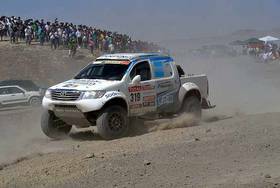 On another exhausting stage, on which almost all the top drivers got stuck at least once, the duo defended third place and now have almost an hour advantage over opposition who were regarded as being much stronger at the start of the rally. 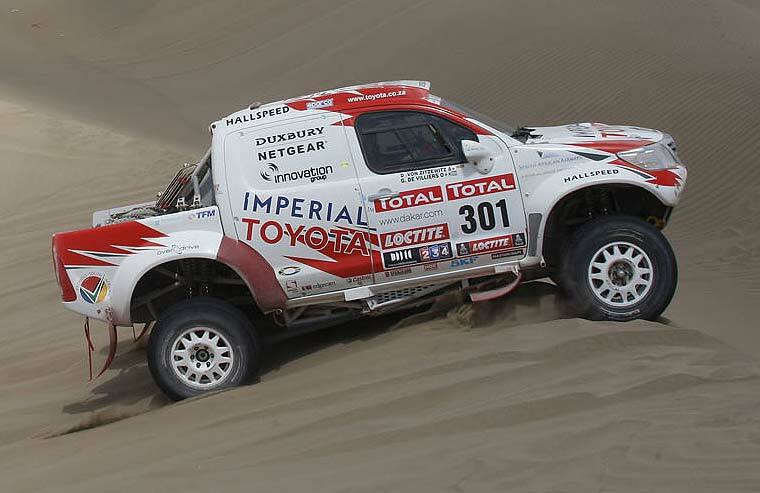 "Today's dune crossings were once again extremely demanding, and we did not manage all of them without any problems" reported Giniel de Villiers. "We got stuck once, but otherwise we had a good run. We are obviously very pleased to have strengthened our third place. However, it will only be safe once we have driven over the ramp in Lima tomorrow. I am really looking forward to that, as the fans in Peru are absolutely fantastic. They have created a great atmosphere and are extremely euphoric. I like that a lot." Dirk von Zitzewitz added: "We got stuck again today, but this time it required me to get physical. I had to give Giniel a push to get him over the crest of the dune and then chase him for about 300 metres. 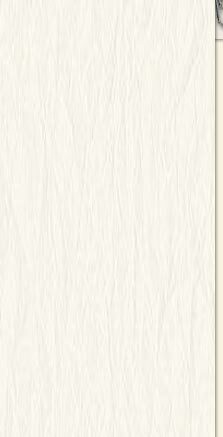 We made up a lot of the time we lost there when there was some confusion with the navigation at a waypoint. I was the first to find the way out of there, which enabled us to be the first car into the finish. 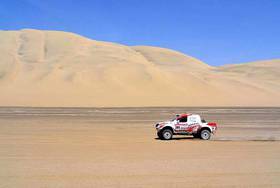 Both yesterday's and today's stages were great: They were just as Dakar stages should be. That is what makes the Dakar so special." 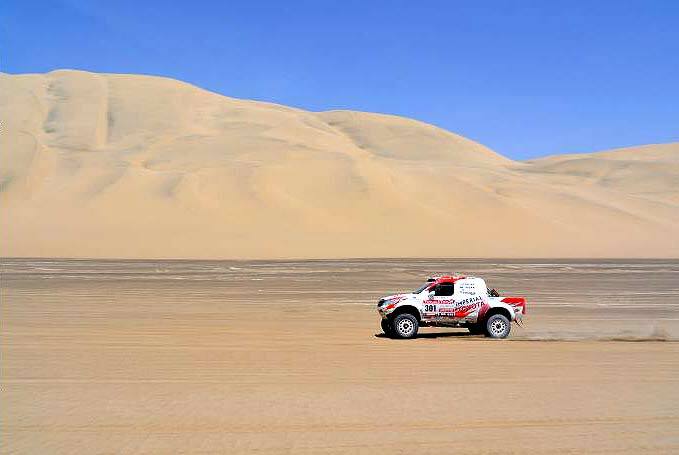 29 relatively easy kilometres of special stage now lie between de Villiers/von Zitzewitz and third place when they arrive at the podium in the Peruvian capital of Lima - a short hop in marathon rallying. Concentration is still required ahead of the short final section, however. Nobody wants to undo all the hard work of the last two weeks and put one of the best sporting performances by driver, co-driver and team at risk due to carelessness.